Swiveling 7" dia. top plate. 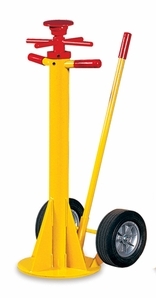 Height Range 41"-50 1/2" Top 7" Base 14" Load Bearing Capacity 60,000 lbs. * Load Capacity based on actual vertical loading. Load test reports available upon request. Be careful when comparing capacity claims between different brands of trailer jacks. The true measure of strength in a jack is its tested load bearing capacity. Install a pair of jacks at front of trailer against the smooth underfloor and always in front of the kingpin. • Class 2G Acme screw threads for a smooth fit and good support. • Removable bushing to allow replacement of screw assembly. • Swivel head tilts 9" to reduce side load bending force. • Zerk fitting provides uniform and constant lubrication of screw threads. • Bolt and washer prevent over-extension of screw. • Steel sleeve protects axle. • Spare parts always available. • Powder coated yellow finish.